… is a pack of nice people, who enjoy doing different educating and social activities while having fun, and support each other in developing their communication and everyday leadership skills. Our mission is to be supportive and positive to every club member and provide them with the opportunity to develop communication and leadership skills to give them self-confidence and help in achieving personal goals in private and professional lives. From a humble beginning in 1924 at the YMCA in Santa Ana, California, Toastmasters International has grown to become a world leader in helping people develop their communication and leadership skills. The non profit organization now has hundreds of thousands of members in way over a hundred countries, offering an enjoyable way to become more competent in communicating ideas as well as everyday leadership. Toastmasters clubs can be found in the U.S. Senate and the House of Representatives, and all over the world in a variety of community organizations, prisons, universities, hospitals, military bases and churches. Thousands of corporations choose to sponsor in-house Toastmasters clubs as effective, cost-efficient communication training workshops for employees. This proves the effectiveness of the simple learning formula of TI. Ralph C. Smedley, the founder of Toastmasters International, named the first group “The Toastmasters Club” because he thought it suggested a pleasant, social atmosphere. And that atmosphere is certainly one of Toastmasters great advantages along with exceptional educational program, tiny costs and networking opportunities. 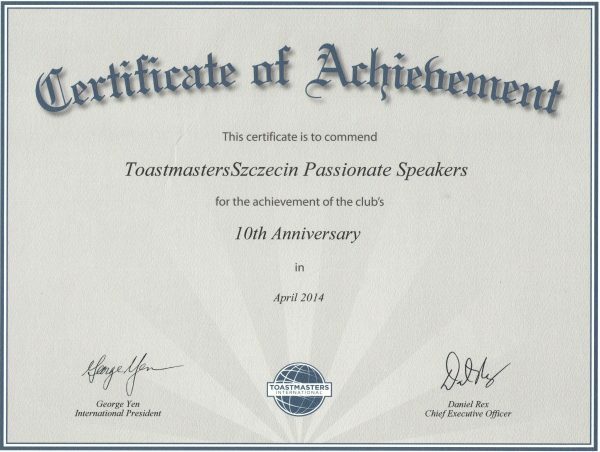 The first TM club in Poland Toastmasters Polska SA (Speakers Anonymous) was set up in Warsaw on 1st July 1994. TS Passionate Speakers in Szczecin followed in 2004, and since then a number of English and Polish speaking clubs in different locations in Poland have been chartered or are waiting to be chartered, and Polish TM clubs are being established abroad. April 2014 saw us celebrating the 10th anniversary. Well done us! On 5th November 2011 at ZSRG, ul. Krzysztofa Kolumba 86, Szczecin the District 59, Division C Eastern Germany and Poland Fall Conference 2011 was held. We hosted the first division conference in Poland! The Humorous and Table Topics Speech Contests were held in English, German, and for the first time in Polish. It was a great integration, networking and leadership opportunity! Over 70 Toastmasters from Poland and Germany, and a number of guests and media people came to watch our speakers at their best and support them! After 7 years, our dear Club got a new name. We decided to start a new chapter in the history of Toastmasters Szczecin, boost some new energy into the old structures, combine the experience of the past and the power of the present and the expectations of the future. We approached the issue with great passion and so became TS Passionate Speakers. The first Spring Speech Contest after joining District 59, which we organised together with Sedina TM, was a real challenge. We had to meet all formal requirements and collect and train the judges. For the first time in Poland the speech contest in German was held. That would not have happened without the help of our good friends from Germany including Jan Dangendorf and Benjamin Bruehl from First Berlin Toastmasters. Our first child Sedina TM was born and started life of its own. July 2007 saw us busy preparing the almost first in Poland 🙂 TM Officer Training. It was successful, fruitful and spectacular thanks to our professional and committed organizers. Monika Wasilewska and Monika Kasprzyk, the president of Sedina TM at that time, went to great lengths to arrange everything to the smallest detail. The meeting of Toastmasters from all over Poland took place at the Szczecin Town Hall, the venue of the Business Club Szczecin. Darek Wojcieszek hosted the meeting appropriately and all TS VIP and Sedina members worked conscientiously to make this a useful and unforgettable experience. The heart of that weekend training was the workshop by our guest speaker of Amsterdam Toastmasters, Bill Monsour. Businessman, actor, singer, Bill Monsour taught us everything from voice emission, relaxation techniques and stage management to preparation and planning of the speech. The main emphasis was on the audience – ask yourself questions: who is your audience, why would they listen to you, why do you want to speak about this topic? And finally, speak from your heart – those were the words all participants took home with them. If you really believe what you say, you’ll find proper words, use just the right body language, you’ll be convincing and charismatic. Not surprisingly, after a couple of years of TS VIP functioning successfully, Monika had another thought. It would be nice to practise public speaking in Polish for a change. We were experienced, full of enthusiasm and ideas, so we had to start the new initiative with a flourish. Monika and Piotr Sulikowski arranged an excellent venue – Polskie Radio Szczecin Concert Hall. The Radio gave us wonderful support – our Demo Meeting got a lot of publicity and nearly a hundred people came to find out about Toastmasters. Ewa Mazurkiewicz who was the host of the meeting explained the TM opportunities and introduced the guests to the topic What Do Tigers Like The Best? The tigers – TS VIP members and the guests talked about the things they were keen on. Then, three Toastmasters delivered very different speeches to show the audience the diversity of Toastmasters educational program. Our German friend Jan Dangendorf delivered his first speech in Polish. His comments on the beauty of Polish women attracted, needless to say, great applause. Our good, reliable friend Monika Królak from the Warsaw Club presented a motivational speech, singing and juggling grapefruits, encouraging people to join Toastmasters. Finally, Agata Jagiełło presented a Toast, or rather a more appealing and interesting variety of a toast – a Roast, which, apart from praising a person, points out at their faults in a witty and friendly way. The Demo meeting earned us enough publicity to collect the team of keen people who were to form the Polish speaking club in Szczecin. One man’s thought can become a worldwide reality. In this case, a woman’s thought. Conference organiser incapable of public speaking? It was year 2002. Monika Wasilewska-Serwiak was working in Warsaw as a Conference Manager – organising conferences for several hundred people was peanuts for her. Oh, but for one thing – she was hysterically afraid of public speaking, so she desperately avoided performing in public, especially that she was barely audible even on a microphone. It was a torment till the first Toastmaster came into scene, Glen Gregory from the Warsaw Club Toastmasters Polska Speakers Anonymous who invited her to the meeting one February day. And so, shaking, trembling, knees going wobbly, Monika, with a little help from TM friends, made her way from the first warm up session to her first speech in May, when a whole new world opened before her … public speaking is great! And she was doomed to become a great speaker. So, when a couple of months later Monika had to leave Warsaw for Szczecin for good, she was devastated and little comfort took she at that time from her TM friends promises that they would help her set a new club in Szczecin. But, in December 2002 a phone rang and Jerzy Gzula, the Warsaw TM friend asked laconically: what about Szczecin Club? Monika embarked on the task methodically: find a place – InBIT! always open for new ideas! She had a sponsor. Next step: organisation of the Demonstration Meeting, here her Warsaw friends were there to help her, which she never doubted. But that was not the end of nice surprises. January 2003: Berlin, Meister Redner Charter Party. Monika went there to congratulate them on the organisation of the new club, but also as a prospect president of a new club she wanted to observe other Toastmasters as much as possible. Finally, although she met most of them for the first time at that party, she was hoping to get someone to come to Szczecin to the demonstration meeting. Monika did not expect much as Szczecin TMs had no resources to host everyone, no money to offer refund for their trip to Poland, not even enough club members to lodge them. Many people at the party promised to come to the Demo Meeting, but she did not believe that would happen. On March 8th 2003 the unbelievable came true. Ten people from Warsaw and 11 from Germany – Berlin, Hamburg, arrived. They made a fantastic meeting, and thanks to them the idea of Toastmasters International found its new home in Szczecin. New people, very important to the future history of the club entered the stage here: Kasia, Magda, Piotr, Przemek, Witek and Mirek decided to join. We must not forget Paweł who not only opened the official Fan Club of Toastmasters Szczecin :), but brought in the best meeting leader – Ewa. We started our regular meetings in May 2003. The second meeting was also very important, as we had to agree on the name of our club. Just like our friends in Warsaw who had a clever name with a funny story in the background – Toastmasters SA (Speakers Anonymous), we also wanted something light, spontaneous and enthusiastic. Our sponsor and the meeting place was the Academy of European Integration, a part of InBIT, in short WSIE (Polish abbreviation) – which, by coincidence, in dynamic translation is Villages, so brainstorming for the name we could not somehow avoid the association that we were THE VILLAGE PEOPLE …, especially that some of us were working for the institution. Another word of that time was integration: we wanted to integrate the English speaking community in Szczecin, we wanted to integrate with other Toastmasters, our host was The Academy of European Integration, and Poland was preparing for the integration with the EU and, on top of all that, our Grammarian chose INTEGRATION as “the Word of the Day” at the meeting! We couldn’t ignore all those signs. After half an hour of shouting out all possible configurations of the words, the result of this disco inspired session was VIP – Village Integrated People – the new name for the new Szczecin Club. We kicked off really fast, but it took exactly a year to collect 20 people required by the Toastmasters Headquarters for the registration of a new club. Finally on April 16th 2004 the Toastmasters Szczecin VIP Club No 624526, the second official English speaking TM Club in Poland, was registered. Our next success was organisation of the Corpus Christi Retreat 2004 in Osieki near Koszalin. This official meeting of all Polish Clubs gave us the chance to meet other Toastmasters from Poland and abroad. We used it to announce our charter to the world.